Joan Elizabeth Johnson age 93 of Joplin passed away on Tuesday, March 27, 2018 at Freeman West Hospital. She was born on May 28, 1924 in Joplin to Joseph Bly and Hazel (Turpin) Bly. 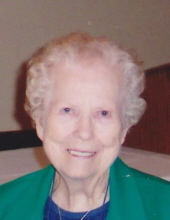 Joan retired from Southwestern Bell Telephone after 37 years of service; she was a member of the Carterville United Methodist Church, the Webb City Order of the Eastern Star, the Ladies Auxiliary of Fleet Reserve Association and the Freeman Hospital Auxiliary. She was married to Guy Don Johnson on November 27, 1955 in Carterville and he preceded her in death on February 13, 2014. Joan is survived by her brother, Daniel Turpin Bly of North Wales, United Kingdom; along with several nieces, nephews and extended family members. Funeral services will be held on Monday, April 2, 2018 at 1:00 PM in the chapel of Simpson Funeral Home in Webb City. The family will be present for a visitation on Monday from 12:00 PM until the time of the service. Burial will follow in Ozark Memorial Park Cemetery. The family would like to thank the staff at Galena Nursing Center for their excellent care and compassion while she was living there. In lieu of flowers the family suggests memorial contributions be made to the Carterville United Methodist Church in her memory. Services are under the direction of Simpson Funeral Home in Webb City.